Ever since my mum started to downsize and asked me to help get her stuff organized, the back of my mind has been full of its own Get Rid Of Stuff! ideas that keep crowding to the front and making it hard to just sit down or take a nap. You just don't appreciate the weight of even the most adorable collectibles, for example, until you have to find space for them. Even my knitting has taken a hit - less time of course, but also, I'm increasingly preoccupied with using up my stash. This last weekend things got particularly hairy. Around 3pm Saturday I shut off the logical part of my brain and started to overhaul my storage room. I didn't stop until about 9pm Sunday though really I should have kept going until some time next week. The plan was to ditch 50% of the shelving and 60% of the stuff I've kept in the space. I got the shelving dismantled and out the door and sent a lot of things away as Goodwill donations, but if I took a photo of the room right now you would think it was the 'before' shot. I will have to make a lot more tough calls. Two sets of things I won't be saying Buh-bye! 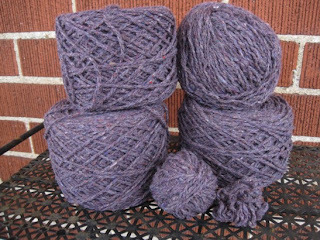 to are purple yarns passed on to me by a friend, though it would aid greatly in the effort to keep them if I could think of what to do with them. 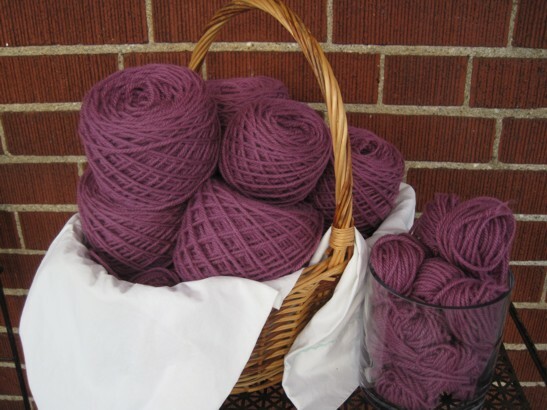 I love this colour and I know it will be super soft when knit up. And there are 900 yards here. Maybe I should use it as the base for a swingy vest with a Fair Isle yoke? Some of the broken strands are long enough to do a round in Fair Isle, probably. So I think I might do a big sweater with a colourful yoke and sleeves. Or maybe knit squares to sew into a blanket later? I'm so bad with decisions. But I can tell you - after two days of moving and lifting and shifting and bag-filling and despairing only to be renewed by even more exhausting hope - it is a nice problem to sit down and have. 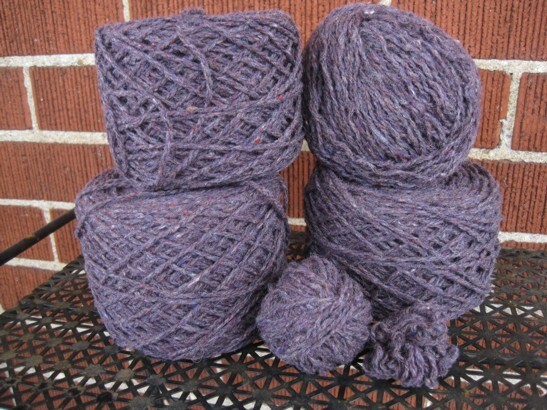 As long as the yarn is feltable, you can spit-splice the little balls into a larger length. The extra bulk of the overlapped strands is reduced when they felt together- you'll never know where the splices were (after they dry, thaat is). Aha! thanks - I'll do that!